Must be used with Invisi-Fast™ and/or Angle Invisi-Fast™ Kits. Kit includes 100 pieces, 200 ACQ Compatible Square Drive Deck Screws, 1 Square Driver. Match one (1) Plus fastener per one (1) Invisi-Fast with spacer or Angle Fastener. Covers approx. 50 sq. feet. Step 3: Secure the deck board by using the corresponding upper hole. Step 4: Lay the next board in place to assure proper orientation. Simply flip the deck board (top surface facing down) onto the previous deck board. Visually align the board making sure it is flush with the previous board. Step 5: Place the Invisi-Fast Plus™ fastener onto the deckboard, between the joists. Align the fastener with the edge of the board using the alignment mark (labeled EDGE on the Plus fastener) and fasten using the 2 screw holes with screws provided. Note: Make sure the EDGE alignment mark faces down when you fasten to deck board. Note: When two deck boards meet, make sure the Invisi-Fast Plus™ fastener is installed near the Invisi-Fast™ with spacer. 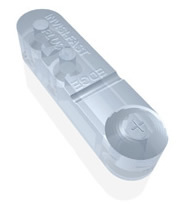 Tip: It may be helpful to use your finger as a guide when aligning the Invisi-Fast Plus™ fastener to deck board. Step 6: Flip the board over, making sure the board is flat on the joist and tight up against the Invisi-Fast™ with spacer. Repeat steps 2 through 6 and continue for the length of the deck.